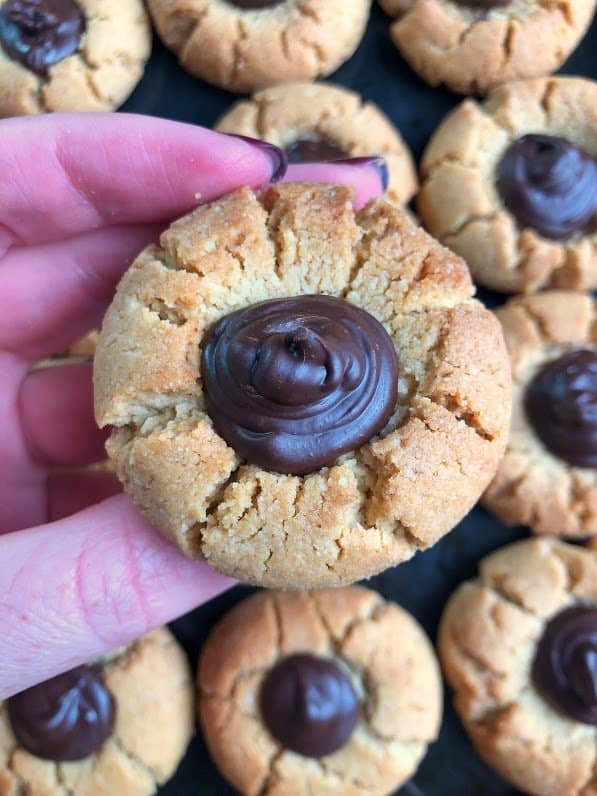 These healthy peanut butter blossoms are a healthier take on the original cookie with a Hershey kiss in the middle, but these are made gluten free, vegan and without any refined sugar! They are made with almond flour, natural peanut butter, and maple syrup. Each day this week, I will be posting a new cookie recipe that is perfect for the holidays and will help make your holiday baking that much easier. We all like having options for dessert, right? So all you need to do is grab a grocery list, write down what you need to buy, head to the grocery store and get to baking!! Yup, I did it. I took one of the most classic Christmas cookies and turned it into a healthier version, and not just any version…one with an actual healthier Hershey kiss in the middle. 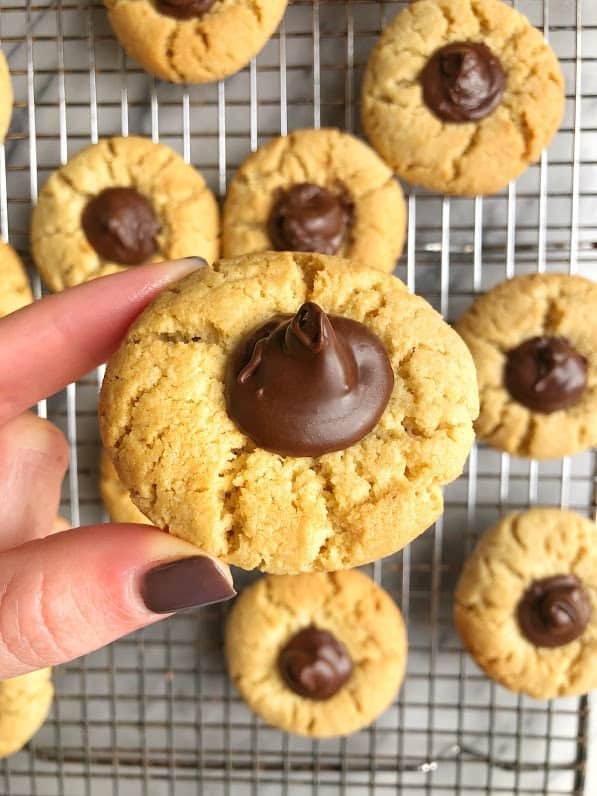 I’ve seen several versions of these healthier peanut butter blossoms online, but never any that actually attempted to recreate the Hershey kiss, so I knew I wanted mine to try and do that because that’s what makes it an authentic peanut butter blossom, right? It took a few different tries and a few different mixture of chocolates to create the ultimate center that would stack up and harden like a regular kiss. If you just use regular melted chocolate, it won’t firm up enough to actually hold shape. You need it to be thick and also the right temperature, but lucky for you guys I did all of that guess work and found the perfect way to make a Hershey kiss! Growing up, my mom would always go to a cookie exchange and I was always sooo excited for when she got home so I could rummage through all of the cookies and count how many peanut butter blossoms she would get. She would always let me eat one or two before she made me put away all of the cookies until Christmas! The torture. She went to this cookie exchange for ten years in a row and many of the ladies would bring the same cookies over and over again, so I got to know what to expect. One lady made these oatmeal raisin chocolate chip (only time oatmeal raisin cookies are acceptable is if they have chocolate chips too) with a white chocolate and milk chocolate drizzle on top. I was obsessed. Other cookies included rugelach, peppermint cookies, biscotti, mexican wedding cookies, lemon ricotta cookies, chocolate covered ritz crackers with peanut butter, oreo truffles, and so many more. With over 20 ladies in attendance, there were always some really delicious cookies. 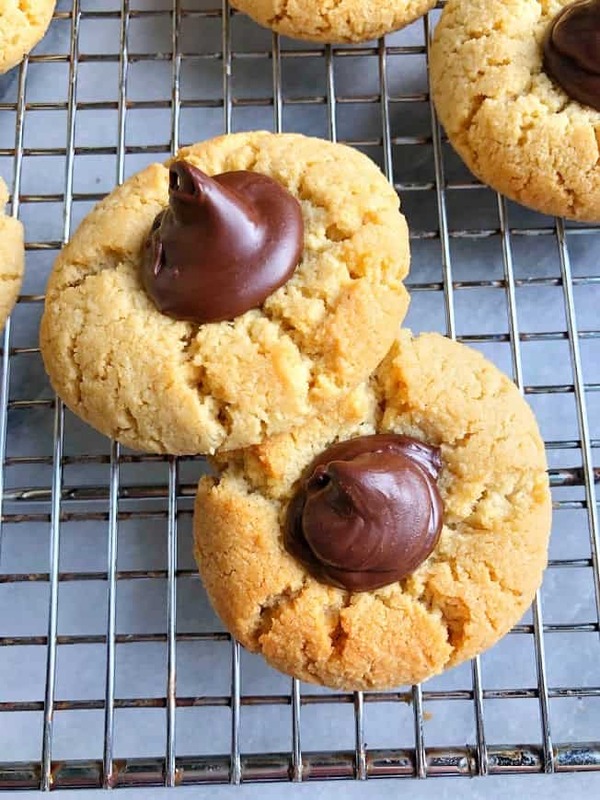 But I specifically remember the peanut butter blossoms and would even love when they placed a mini Reeses inside instead of a Hershey kiss…that was delicious. 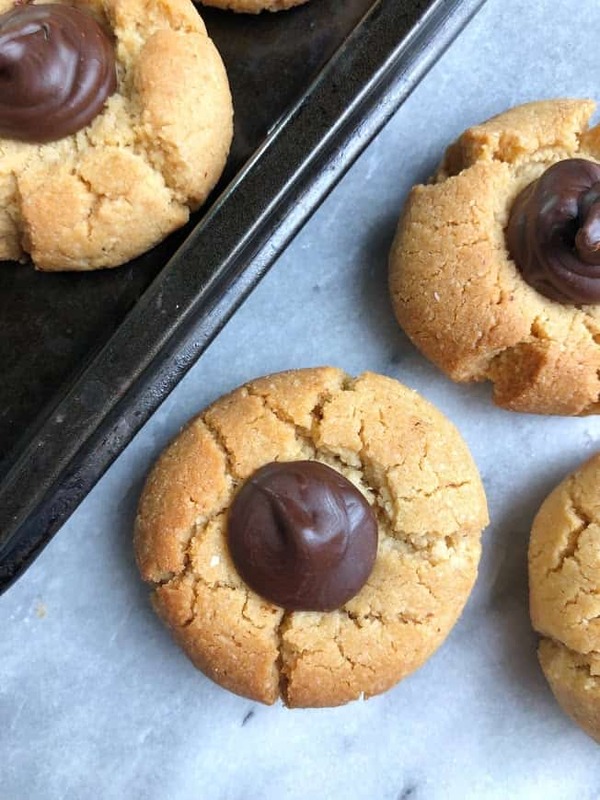 So these healthy Peanut Butter Blossoms are a treat because they combine my favorite cookie with nutrient dense ingredients. I call that a win-win situation if you ask me. If you’re paleo feel free to replace the peanut butter with almond butter in this recipe! Or any other type of nut butter actually. 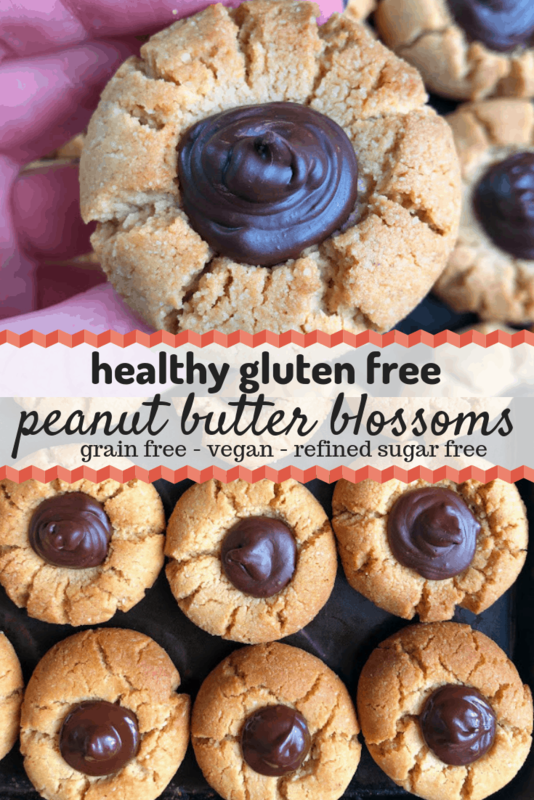 Enjoy these healthy peanut butter blossoms!! In a small bowl, mix peanut butter, coconut oil, maple syrup, and vanilla until well combined. In a large bowl, mix almond flour, baking soda and salt. Add wet ingredients to dry and stir until fully mixed. Flatten with hand on parchment paper and press thumb into middle of cookies. Bake for 10-12 minutes or until slightly golden brown. You may need to use the back of a wooden spoon or finger to press down centers again. In a microwave safe dish, add peanut butter, coconut oil and chocolate chips. Microwave in increments of 30 seconds until completely melted, stirring after each time. Once completely melted, stir in cocoa powder. Pour into ziplock bag (sandwich size or larger) and store in fridge for 30 minutes. You don’t want it to turn solid, but instead cool down and get thick enough to pipe onto cookies. You may need to chill it longer. Once cookies have COMPLETELY cooled, cut little piece off the corner of the ziplock baggie and pipe chocolate mixture into center in the shape of Hershey Kiss. Let set completely before storing. Store on counter in airtight container. Mmmmm these are the best. They didn’t even last the day in my house. Will have to triple the ingredients next time. 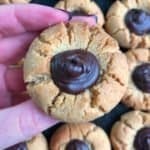 They are fantastic… Totally had been craving peanut butter blossom’s for weeks due to the holiday time, but didn’t want to make them due to how unhealthy they can be! Any who, came across this recipe. The boyfriend says he likes them more than the regular ones. I’m so impressed that they are gluten free and diary free…. Will make again, and again, and again! Way to make my day, Emily!! So glad you are enjoying them 🙂 That makes me so happy!! These are wonderful! Taste and texture fantastic. Easy to make too. I just spooned the chocolate/PB into the center rather than piping it with a bag, but they still looked good–and tasted even better! Love them. Thanks so much.